Welcome to the home of Expression Records, the record label owned by Phil Manzanera.Phil is one of the UK’s best-known musicians and record producers, having shot to prominence in the early ’70’s as the lead guitarist with the seminal band, Roxy Music. He is widely acknowledged as one of the world’s leading guitarists and is in much demand both as a performer and record producer. In 2006 Manzanera co-producied David Gilmour’s 2006 chart topping album, On An Island and played in Gilmour’s band for tours to Europe and North America. He has recently written and presented a 14 x one hour series for radio station, Planet Rock, ‘The A-Z of Great Guitarists’ and is currently working on his new instrumental album, Firebird VII, to be released in 2008. Phil Manzanera was born in London to a Colombian mother and English father, and spent most of his childhood in different parts of the Americas : Hawaii, Venezuela, Colombia and Cuba. It was in Cuba that the young Manzanera, aged 6, encountered his first guitar, a Spanish guitar owned by his mother. Phil’s early musical accomplishments were Cuban folksongs learnt against the upheaval of the Cuban Revolution. In Venezuela the eight year old Phil started experimenting with the sounds of the electric guitar, a cello electric. During his teenage years Phil was absorbing and marrying the twin influences of 60’s rock and roll with the Latin-American rhythms of the merengue, cumbia and particularly the boleros of the Mexican, Armando Manzanero. Manzanera was determined to join a professional band and by the New Year of 1972, aged 22, he had joined the recently formed Roxy Music as lead guitarist - the line-up at this time was Bryan Ferry, Brian Eno, Paul Thompson and Andy Mackay. Roxy’s rise was meteoric, with the band being hailed as the stylistic influence of the early 1970’s. During the next 12 years, until 1983 when the band members went on a ‘long break’, Roxy Music released a series of international best selling albums, achieving ten UK top ten albums and touring extensively throughout the world. In parallel with Roxy Music, Manzanera has alway pursued solo projects, both recording his own albums and producing for others. All his previous solo albums have been digitally remastered and re-released with new artwork, available on his own label, Expression Records through his web-site, www.manzanera.com. As a writer, producer and solo artist, Phil Manzanera has worked with many of the luminaries of modern music, such as Steve Winwood, David Gilmour, John Cale, Godley and Creme, Nico (Velvet Underground) and John Wetton (King Crimson, Asia). He has co-written material with many artists, including Brian Eno, Tim Finn, Robert Wyatt and David Gilmour. Manzanera co-wrote Pink Floyd’s single ‘One Slip’ from their 1988 ‘Momentary Lapse of Reason’ album. In the 90’s Manzanera performed in concerts all over the world, including ‘Guitar Legends’, the five day guitar festival in Seville where he was musical director for the event as well as playing with Bob Dylan, Keith Richards, Jack Bruce and Richard Thompson. Phil has also played in Mexico, Argentina, Colombia, Cuba, Spain, France Italy and the UK, including a ten date European tour with the Cuban band, Grupo Moncada. He played in WOMAD festivals in South Africa, Australia and New Zealand. Phil ended the 20thCentury by appearing with Bryan Ferry at the British Gas Millennium Concert at Greenwich, the first time they had performed together in 18 years. The Roxy Music ‘long break’ came to an end in 2001 with a critically acclaimed, sellout 52 date world tour, featuring Bryan Ferry, Phil Manzanera, Andy MacKay and Paul Thompson. The world rediscovered Roxy Music and the band were shown to be as relevant and influential as ever. In the Summer of 2003 Roxy played 10 dates in the US followed by 13 European gigs in 2004, including performing at Live 8 in Berlin. Roxy fans and the music industry are abuzz with the news that a new Roxy Music album, their first for over 20 years, is due for release in 2008. 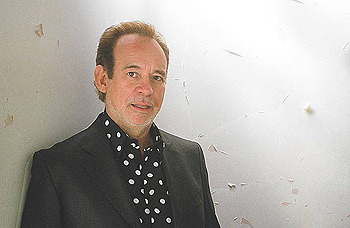 Phil Manzanera has his state of the art Gallery Studios in West London. The first recording was Robert Wyatt’s album, Cuckooland, and so far the growing client list includes Eno ,David Gilmour, Annie Lennox ,Kevin Ayers,and Chrissie Hynde. Robert Wyatt’s current critically acclaimed album, Comicopera, was recorded at Gallery this year. Phil Manzanera defies easy musical definition, preferring to continually explore new musical directions and experiment with sounds and styles - singing on his own albums began with Vozero in 1999, followed by 6PM in 2004 and 50 Minutes Later in 2005, continuing Phil’s musical journey, one that takes many twists and turns , and shows his enduring passion and talent for making music. ExpressionRecords.com powered by:WordPress and Tubemap queries. 0.099 seconds.